I met Margaret Mizen this year and was instantly touched by her warmth and personality. Having learnt more about the family, I feel humbled to have met them and am in awe of what they have achieved in the name of Jimmy, who clearly was, and is an inspiration to us all. It was a privilege to be one of so many amazing people raising money for their chosen charities. I arrived at the start zone nearly at the back alongside a dinosaur, a pantomime dame and two people in a canoe. Not an ideal position for me. However, I quickly made my way through the field running well above my pace time, passing amongst others; a camel, a post box and a guy dressed as a whoopee cushion. The people along the route were amazing and I quickly lost count of the high fives I gave to all the children, and adults who excitedly held their hands out. The crowds and sheer wall of noise at the Cutty Sark took my breath away and I felt a little emotional as I crossed Tower Bridge at the halfway stage. All of my family and friends were waiting in Narrow Street to offer fantastic support as I stopped to drink and say hello. The last mile went past in a blur and after running past Buckingham Palace and turning down the Mall the finish line was in sight. I crossed the line in a time of 4 hours, 18 minutes and 20 seconds, which was a personal best. 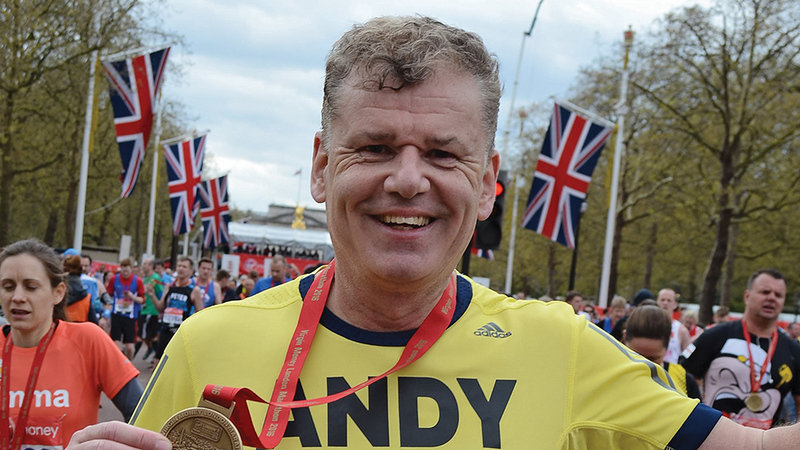 I remember saying to Margaret the first time I met her that I would like to run a race for Jimmy, and I really believe it was destiny that got me a place in the London Marathon this year. I was so proud to represent For Jimmy and raised over £1,000 to support the work of the charity.